We’ve reached a point in time where training for hockey off the ice is a must if you’re looking to go places in your hockey career. Sure there’s the odd exception to the rule, where a phenom comes along once every 10 or 15 years that just seems to have the natural ability and skills that were meant for big time hockey. But if you have any fantasies about playing big-time hockey, I wouldn’t count on yourself being that exception. That doesn’t mean that you should give up all hope though. There’s plenty of big-time hockey to go around, besides the NHL, and putting in the hard work off the ice will improve your chances drastically of achieving your dream. Off ice training is where your focus needs to be because the benefits of strength training for hockey are numerous. We’ve all seen the kid that seems to skate faster than the rest of the group growing up. He has a huge advantage over the rest of the pack because his speed gets him to places on the ice faster than everyone else. But as time goes on, the pack starts to catch up. Kids mature at different paces. And once these kids reach a certain age, like around 10 to 13 years old depending on their physical maturity, strength training can take the kids that were trailing a bit and make them into the faster kids on the ice. If you think that being fast is only about being lucky enough to have been born with it, you’re only partially right. Some guys are just born faster than others, but speed is one of those things that can be improved with training. You see, the greater the amount of force you can put into the ground, the faster you’ll be. So in order to get faster, you need to improve your strength. I’ll be the first to admit that running short sprints is a great way to get faster, but that will only take you so far. When you increase your strength, the ceiling for how fast you can get all of sudden gets higher. Doing sprints as well as strength training together then becomes a killer combo. Increasing lower body strength with strength training has other benefits as well. If you’ve ever gone into the corner to fight for the puck and are always the one that ends up on the ice, you’re probably lacking the strength in your lower body to keep yourself upright while an opponent is trying to move you. Becoming stronger in the lower body suddenly helps you become the player that does the knocking around in the corner. 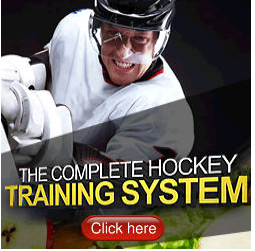 The other half of your body, the upper half, also needs to get stronger too if you have visions of high level hockey. Just like how lower body strength helps you in the corners, upper body strength. What’s even better than being able to move guys around is the ability to rifle the puck by goaltenders. That is what wins games right? Although lower body strength plays a huge part in shot power, you also need a strong core and upper body to really blast the puck. The benefits of strength training for hockey keep adding up when you really think about it. I’ve seen players’ confidence sore once they start adding muscle and strength to their frames. Mindset is huge when it comes to hockey in particular because of the physical nature of the game. So the next time you think you’re doing enough to become a great player, hopefully you haven’t left out strength training off the ice from your development program. Strength training is vital to hockey players. They play with the same strength like football players but the difference is the footwork. Sport is Life! Check Out This Article to learn about nutrition, motivation and workouts!